William Jack Baumol (born February 26, 1922) is an American economist. He is a professor of economics at New York University, Academic Director of the Berkley Center for Entrepreneurship and Innovation, and Professor Emeritus at Princeton University. A prolific author of more than eighty books and several hundred journal articles, Baumol has written extensively about labor market and other economic factors that affect the economy. He also made significant contributions to the theory of entrepreneurship and the history of economic thought. He is among the most influential economists in the world according to IDEAS/RePEc. He was elected a Fellow of the American Academy of Arts and Sciences in 1971. He was considered a candidate for the Nobel Prize in Economics for 2003, and Thompson Reuters cited him as a potential recipient in 2014. He was initially denied entry to the doctoral studies at the London School of Economics and was instead admitted to the Master's program. After witnessing his debating skills at Lord Lionel Robbins' seminars, he was within weeks switched to the doctoral program and also admitted to the faculty as an Assistant Lecturer. His Ph.D. oral exam lasted five hours. While a professor at Princeton University he supervised some graduate students who would eventually become very well-known economists, including Burton Malkiel, William G. Bowen, and Harold Tafler Shapiro. Among his better-known contributions are the theory of contestable markets, the Baumol-Tobin model of transactions demand for money, Baumol's cost disease, which discusses the rising costs associated with service industries, Baumol’s sales revenue maximization model and Pigou taxes. His research on environmental economics recognized the fundamental role of non-convexities in causing market failures. William Baumol also contributed to the transformation of the field of finance, and published contributions to the areas of efficiency of capital markets, portfolio theory, and capital budgeting. The place of the disruptive innovations and innovative entrepreneur in traditional economic theory (which describes many efficiency-based ratios assuming uniform outputs) presents theoretic quandaries. William Baumol has added greatly to this area of economic theory. The 2006 Annual Meetings of the American Economic Association held a special session in his name, and honoring his many years of work in the field of entrepreneurship and innovation, where 12 papers on entrepreneurship were presented. The Baumol Research Centre for Entrepreneurship Studies at Zhejiang Gongshang University is named after William Baumol. In 2003, Baumol received the Global Award for Entrepreneurship Research "[f]or his persistent effort to give the entrepreneur a key role in mainstream economic theory, for his theoretical and empirical studies of the nature of entrepreneurship, and for his analysis of the importance of institutions and incentives for the allocation of entrepreneurship." The British news magazine, The Economist published an article about William Baumol and his lifelong work to develop a place in economic theory for the entrepreneur (March 11, 2006, pp 68), much of which owes its genesis to Joseph Schumpeter. They note that traditional microeconomic theory normally holds a place for 'prices' and 'firms' but not for that (seemingly) important engine of innovation, the entrepreneur. Baumol is given credit for helping to remedy this shortcoming: "Thanks to Mr. Baumol's own painstaking efforts, economists now have a bit more room for entrepreneurs in their theories." William Baumol's book, The Microtheory of Innovative Entrepreneurship is the first formal theoretical analysis of the role of innovative entrepreneurs. Baumol is a trustee of Economists for Peace and Security. Baumol is known for his interests in the economics of art, including the economics of the performing arts. "A Community Indifference Map: A construction", 1949, RES. "A Formalization of Mr. Harrod's Model", 1949, EJ. "The Analogy between Producer and Consumer Equilibrium Analysis", with Helen Makower, 1950, Economica. "The Transaction Demand for Cash: An inventory-theoretic approach", 1952, QJE. "The Classical Monetary Theory: The outcome of the discussion", with G.S. Becker, 1952, Economica. "Firms with Limited Money Capital", 1953, Kyklos. "More on the Multiplier Effect of a Balanced Budget", with M.H. Peston, 1955, AER. "Acceleration without Magnification", 1956, AER. "Variety in Retailing", with E.A. Ide, 1956 Management Science. "Speculation, Profitability and Stability", 1957, REStat. "Activity Analysis in One Lesson", 1958, AER. "On the Theory of Oligopoly", 1958, Economica. "Topology of Second Order Linear Difference Equations with Constant Coefficients", 1958, Econometrica. "The Cardinal Utility which is Ordinal", 1958, EJ. "Integer Programming and Pricing", with R.E. Gomory, 1960, Econometrica. "What Can Economic Theory Contribute to Managerial Economics? ", 1961, AER. "Pitfalls in Contracyclical Policies: Some tools and results", 1961, REStat. "The Theory of Expansion of the Firm", 1962, AER. "Stocks, Flows and Monetary Theory", 1962, QJE. "An Expected Gain-Confidence Limit Criterion for Portfolio Selection", 1963, Management Science. "Decomposition, Pricing for Decentralization and External Economics", with T.Fabian, 1964, Management Science. "On the Performing Arts: the anatomy of their economic problems", with W.G. Bowen, 1965, AER. "Investment and Discount Rates Under Capital Rationing", with R.E.Quandt, 1965, EJ. "Informed Judgement, Rigorous Theory and Public Policy", 1965, Southern EJ. "The Ricardo Effect in Point-Input, Point-Output Case", 1966, Essays in Mathematical Economics in Honor of Oskar Morgenstern. "Macroeconomics of Unbalanced Growth: The anatomy of urban crisis", 1967, AER. "Calculation of Optimal Product and Retailer Characteristics", 1967, JPE. "The Firm's Optimal Debt-Equity Combination and the Cost of Capital", with B.G. Malkiel, 1967, QJE. "Error Produced by Linearization in Mathematical Programming", with R. Bushnell, 1967, Econometrica. "The Dual of Nonlinear Programming and its Economic Interpretation", with M.L.Balinski, 1968, RES. "On the Social Rate of Discount", 1968, AER. "On the Discount Rate for Public Projects", 1969, Analysis and Evaluation of Public Expenditures. "Input Choices and Rate-of-Return Regulation: An overview of the discussion", with A.K.Klevorick, 1970, Bell JE. "Optimal Departures from Marginal Cost Pricing", with D.F. Bradford, 1970, AER. "The Economics of Athenian Drama", 1971, QJE. "On the Economics of the Theatre in Renaissance London" with Mary Oates, 1972, Swedish JE. "The Dynamics of Urban Problems and its Policy Implications", 1972, in Preston and Corry, editors, Essays in Honor of Lord Robbins. "Taxation and the Control of Externalities", 1972, AER. "Detrimental Externalities and Non-Convexity of the Production Set", with D.F. Bradford, 1972, Economica. "The Transformation of Values: What Marx 'Really' Meant", 1974, JEL. "Contestable Markets: An Uprising in the Theory of Industry Structure", 1982, "AER". William Baumol was President of the American Economic Association for 1981. ↑ Page 215: Krueger, Alan (2001). "An Interview with William J. Baumol". Journal of Economic Perspectives. 15. pp. 211–231. doi:10.1257/jep.15.3.211. ↑ "Guide to the William J. Baumol Papers". Retrieved February 3, 2013. ↑ "Nobel Prize Winners in Economics Profiles Index". Retrieved February 3, 2013. ↑ "Thomson Reuters Predicts 2014 Nobel Laureates, Researchers Forecast for Nobel Recognition". Retrieved April 13, 2016. 1 2 Page 214: Krueger, Alan (2001). "An Interview with William J. Baumol". Journal of Economic Perspectives. 15. pp. 211–231. doi:10.1257/jep.15.3.211. ↑ Baumol, William J. (1959). "7". Business Behavior, Value and Growth. New York: Macmillan. ↑ Baumol, W. J. (1972). "On Taxation and the Control of Externalities". American Economic Review. 62 (3): 307–322. JSTOR 1803378. ↑ Eliasson, Gunnar & Magnus Henrekson, (2004). "William J. Baumol: An Entrepreneurial Economist on the Economics of Entrepreneurship". Small Business Economics. 23 (1): 1–7. doi:10.1023/b:sbej.0000026049.86377.df. Retrieved October 14, 2013. ↑ Page 2: Guesnerie, Roger (1975). "Pareto optimality in non-convex economies". Econometrica. 43. pp. 1–29. doi:10.2307/1913410. JSTOR 1913410. MR 443877. with "Errata". Econometrica. 43 (5–6). 1975. p. 1010. doi:10.2307/1911353. JSTOR 1911353. MR 443878. Page 73 (and for other contributions of Baumol pages 42, 68, and 155): Starrett, David A. (1988). Foundations of public economics. Cambridge economic handbooks. Cambridge: Cambridge University Press. ISBN 978-0-521-34801-0. Non-convexities also appear in Baumol's theory of contestable markets: Pages 179–181: Salanié, Bernard (2000). Microeconomics of market failures (English translation of the (1998) French Microéconomie: Les défaillances du marché (Economica, Paris) ed.). Cambridge, MA: MIT Press. ISBN 978-0-262-19443-3.
page 88: Laffont, Jean-Jacques (1988). "3 Nonconvexities". Fundamentals of public economics. MIT. ISBN 978-0-262-12127-9. ↑ Malkiel, Burton (1986). "11". 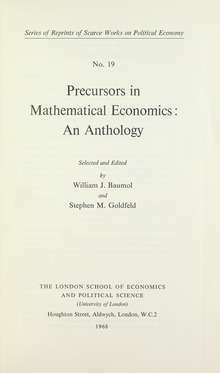 Chapter 11, William Baumol and the Development of the Field of Finance, in Prices, Competition and Equilibrium: Essays in Honour of William J Baumol. Oxford. ↑ "Searching for the invisible man". The Economist. Mar 9, 2006. p. 67. Retrieved 23 December 2012. ↑ "Annual meeting allied social science associations". 2006 ASSA Conference. The American Economic Association. January 8, 2006. Retrieved August 5, 2011. ↑ Magnus Henrekson; Anders Lundstrom (2009). "The Global Award for Entrepreneurship Research" (PDF). Small Bus Econ. 32 (32): 1–14. doi:10.1007/s11187-008-9141-y. ↑ "2003 Award Winner William J. Baumol". Global Award for Entrepreneurship Research. May 2003. Retrieved August 5, 2011. ↑ "The Microtheory of Innovative Entrepreneurship". Princeton University Press. May 2010. ↑ "Macroeconomics: Principles and Policy". Cengage. 2012. ↑ Page vii: Thompson, Gerald L.; Thore, Sten (1992). Computational Economics: Economic Modeling with Optimization Software. Suite 1100, 651 Gateway Boulevard, South San Francisco, California, 94080–7014: Scientific Press. p. xii+352. ISBN 0-89426-201-7.